We’d love your help. Let us know what’s wrong with this preview of The Shadow Cipher by Laura Ruby. It was 1798 when the Morningstarr twins arrived in New York with a vision for a magnificent city: towering skyscrapers, dazzling machines, and winding train lines, all running on technology no one had ever seen before. Fifty-seven years later, the enigmatic architects disappeared, leaving behind for the people of New York the Old York Cipher—a puzzle laid into the shining It was 1798 when the Morningstarr twins arrived in New York with a vision for a magnificent city: towering skyscrapers, dazzling machines, and winding train lines, all running on technology no one had ever seen before. Fifty-seven years later, the enigmatic architects disappeared, leaving behind for the people of New York the Old York Cipher—a puzzle laid into the shining city they constructed, at the end of which was promised a treasure beyond all imagining. By the present day, however, the puzzle has never been solved, and the greatest mystery of the modern world is little more than a tourist attraction. To ask other readers questions about The Shadow Cipher, please sign up. I don't read a lot of middle grade but this plot sounds great to me - how does it read to an adult? Dana Bee I really enjoyed it. Fun & clever. I was wondering if anyone has any discussion questions about this awesome book?My book club is reading it, and I am in charge of finding some questions but I can't find any. 1. The proposed destruction of historical buildings and what it means to the people who live/work in them. 2. The journey to solve the cipher has the protagonists researching some of history's unsung heroes. Did this inspire a curiosity in the reader to find out more about those people? Imagine New York City in the early 19th century. Imagine what would have happened if it had been home to two genius twins. Twins capable of inventing mechanical creations that eliminated waste, used special glass to harness the sun’s energy, and more. Twins who remade the city in their image and created a code in its very streets. Find the code and a treasure is yours. Simple, right? Only no one ever solved it. Now it is modern day and two different twins and a friend in their beloved building have discovered that a greedy real estate developer has bought their home and is mere months away from kicking them out. All seems lost until a mysterious letter arrives. It appears that while the Morningstar twins of long ago did create a cipher for the city to solve, there may have been more than one line of clues to follow. Using their brains, their feet, and more than a little bravery, the three kids set out to solve the mystery and save their building. Yet as they do they come to an unnerving realization. This isn’t just the city that never sleeps. It’s a city that takes pleasure in watching YOU sleep. Laura Ruby, the author, does not live in New York City. I knew this going into the book. I, on the other hand, lived there for eleven years so I’m very attuned to writers getting that city wrong in their fiction. For example, I once read an otherwise admirable middle grade mystery serious where three of the scenes in the book took place in alleyways in Museum Mile. Do I need to tell you that NYC has no alleys and, even if we did, they certainly wouldn’t be on Museum Mile? And one could argue that since Ms. Ruby is dealing with an alternate world Manhattan (the book is primarily set in Manhattan, though there is a very amusing glimpse of Brooklyn in one of the scenes) that she needn’t be so tied to the reality of the city. One could argue that, and one would be wrong. As far as I’m concerned you do the city then you do the research. So I picked up this book and within, I’m gonna say, three chapters I was convinced that Ms. Ruby must have a second secret life in the heart of the Big Apple that she’s let no one know about. Accurate to the city? Baby, you don’t even know the half of it. Okay, here’s just how well Ms. Ruby captures NYC: In one scene our characters are having a discussion when in walks my own kids’ former preschool, Sunshine Daycare. It’s THAT on the nose with the details. Snafus are of the tiny variety. For example, the A train does appear in this story to be an elevated stop at 116th Street when, in fact, that’s actually the 1 train, but I’ll let it lie. And reading this book I was both floored and suddenly hit with a wave of nostalgia. I may not have encountered rollers and Guildmen in my time there, but this is so clearly a love letter to a city I adore that it’s bound to accrue new fans in its travels. After all, it may involve mechanical cleaning caterpillars but this New York also finds the notion of peas in guacamole a crime against mankind. As is right. Interestingly, this alternate world does retain a fair number of pop culture references. So you’ll see mentions of Spider-Man, Legos, Godzilla, etc. I appreciated this. For whatever reason it drives me batty when authors make up fake names for video games or comic book characters. Ms. Ruby even works in a couple Hamilton references, with a mention of Hercules Mulligan and Eliza Hamilton’s life and achievements. There is the occasional made up thing. Angry Bots instead of Angry Birds, for example. And for some reason there are multiple references to The Matrix though it’s never directly named. Still, all told for the most part the book keeps you grounded in reality. Jokes. No one ever praises jokes enough. Be serious all you want but a good joke can be worth its weight in gold. Laura Ruby puts a wide array of them in this book. There are the subtle ones that make a comment on our own New York by praising this hypothetical one (example: “… and they could watch for schools of fish darting through the clear blue water of the Hudson”). And like a lot of my favorite children’s fiction, it has jokes that are going to lead to kids looking up further information, just so that they can stay in the know. For example, at one point a kindly therapist asks why Tess draws crows over her heads when she sketches and her reply is, “That’s not a crown… That’s a nimbus of outrage.” My favorite, however, may be Theo’s shirt that says “Schrodinger’s cat is dead” on the front and then a zombie cat on the back with the line, “Schrodinger’s cat is ALIIIIIIVE.” I will be seeking this t-shirt out to buy presently. And for the record, I’m pretty sure there are a lot of references in this book I wasn’t getting. One of the cipherists met in the book is named Omar Khayyam. In light of that I’m fairly certain that Ray Turnage, Adrian Birch, and Imogen Sparks also have meanings worth discovering. Now let’s talk about how you set up a mystery novel for kids. There are two ways to go about it. I call the two options The Agatha Christie and The Chasing Vermeer. The Agatha Christie model is the hardest to pull off. You give your readers all the facts, lay them out plain and clear, and let them solve the mystery alongside you. When done well this engages the reader and makes them complicit in the solution. Instant audience identification! Brilliant! Then you have The Chasing Vermeer method. Now the book Chasing Vermeer was very popular with kids, so you can’t knock it on that account. It was, however, a book where the mystery and solution was based entirely on coincidences. That’s a frustrating way to set up a novel, and The Shadow Cipher isn’t entirely innocent of this methodology. Early on we learn that as you solve the cipher it solves you. Well that’s awfully convenient. It allows for all kinds of coincidences to occur, from finding the right letter at the right time to solving a part of the cipher mere days before the proposed destruction of the characters’ beloved home. Yet for all that, you get the feeling that Ms. Ruby is playing pretty fair with you. Kids will feel pleased to figure out that a mechanical moth is responsible for the partial blackout in town. They may realize what the twins are doing running around keeping track of the position of one star or another in their building. As a result this book is sort of a combination of the best elements of The Agatha Christie and Chasing Vermeer methods put together. I could have done with less coincidences, but at least they’re interstitial. Creating alternate Americas is not a job for the lazy. I’ve seen it done well in children’s books and I’ve seen it done magnificently catastrophically poorly. Take, for example, the case of The Thirteenth Child by Patricia Wrede, or, as it was known during its publication, “Mammothgate”. In 2009 author Wrede wanted to write a story of an alternate U.S. where magic existed and there had never been a Land Bridge to the North American continent. To avoid pesky racial politics the author had simply erased the Land Bridge and said that there weren’t any Native Americans at all in her fantasy world. Sticky racial politics gone, right? But exchanging mammoths for American Indians (hence the term “Mammothgate”) even in a fantasy is little more than a quick erasing of an entire race simply because they’re inconvenient to your plot. Since the brouhaha that erupted from those choices other authors have tread more carefully. Matthew Kirby in The Lost Kingdom incorporated American Indians into much of his plot (even as he reduced female protagonists to mere fainting females). And here, Laura Ruby could have ignored Native Americans entirely. Or, she could have kept their history identical to that of the real America. Instead, Ruby makes the choice to give them different outcomes. At one point in the background we see an Embassy of the Five Hundred Nations, “flying the colorful flags of First Nations from the Abenaki to the Comanche, Pawnee to the Sioux.” We see Native teens dropping lyrics on the street. Later a mention is made of a fictional superhero named “Super Indian” which, quite frankly, doesn’t exactly sound all that different from the real world Apache Chief. It reminds me of the old Harvey Birdman show where Black Lightning is complaining to Aquaman about his name. When Aquaman doesn’t get the problem Black Lightning says, “How would you like it if I called you White Fish?” Same diff. As odd as it may seem, the book that this reminded me of the most wasn’t the aforementioned Westing Game or Greenglass House but rather The Invention of Hugo Cabret by Brian Selznick. In both cases you have kids encountering old technology with a secret locked inside, just waiting to be revealed. You also have cases where the villain is almost just as much circumstances as it is a big bad guy. I don’t think I’m spoiling much to tell you that the real estate developer with the bad hair who only dates models and is buying up much of NYC (and has five letters in his name, and, and, and…) never makes a physical appearance on these pages. Not this time around. I suspect as the years go by and these books continue to be published we will find ourselves hoping against hope for him to be defeated in a particularly satisfying manner. Greatest Objection to This Book: No libraries. I shall expect this problem to be rectified in future installments. Ditto trips to Staten Island, Queens, and the poor much ignored Bronx. I have a dream that someday someone will set a mystery or fantasy in the Bronx and at long last that borough shall have its due. It is one thing to want to write a scavenger hunt. It another thing to set that hunt in a world so like and unalike our own. And when you go even further and pepper your story’s inherent excitement with eloquence, your final product doesn’t shine. It glows from within. The Shadow Cipher glows. Oh sure, I would have changed stuff here and there, but on the whole the book is strong, sturdy and for all that it’s over 400 pages it’s pretty unputdownable. It won’t matter if a kid knows Manhattan like the back of their hand or has never even seen 5th Avenue firsthand. The city today is just like the city in this book. It’s a puzzle, and every person that visits it attempts to solve that puzzle for themselves. I don’t know what the future holds for future installments of this series, but I do know that NYC should hire Ms. Ruby as their current publicist. A graceful paean to the best of Manhattan, and a shocking, gripping, nail-biting, intriguing mystery for fans of codes, ciphers, puzzles, and treasure. This was so so so so so good! The pacing overall was pretty slow, but the story was so interesting that I didn't have any problems with it! Middle grade meets National Treasure: ITS ALL I'VE EVER WANTED! And THERE ARE GOING TO BE MORE BOOKS? So so SO pumped. This book was a pretty fun adventure. I loved that Laura Ruby put in a lot of little facts about New York with a combination of fantasy and made up stuff also. It made for a good read with three very likeable three main characters. The Shadow Cipher was just… meh. I went into this expecting the National Treasure-like puzzle hunt the synopsis promised - which is one of my all-time favourite tropes, just FYI - but I was completely underwhelmed. It did not tap into its potential. At all! The plot left me desperately wanting more… but not in a good way. The puzzles and ciphers were not nearly as exciting as I would have hoped. The story lacked urgency, drive, something to really pull me into the story and never want to leave. The Shadow Cipher was just… meh. I went into this expecting the National Treasure-like puzzle hunt the synopsis promised - which is one of my all-time favourite tropes, just FYI - but I was completely underwhelmed. It did not tap into its potential. At all! The plot left me desperately wanting more… but not in a good way. The puzzles and ciphers were not nearly as exciting as I would have hoped. The story lacked urgency, drive, something to really pull me into the story and never want to leave. I think this may have been because the world-building was so vague. I was confused what time period this story was meant to be set in? Obviously, it is some sort of alternate New York but how futuristic was it? There was new technology but some of it was more magical than machinery. I desperately wanted more details about all of this and I found the story was not captivating enough to distract me searching for these details. If I was more inclined, I could have put this book down and never picked it up again. I was just not that curious about the cipher’s solution and I should have been. I wanted to be that engaged. Another massive problem for me was that the characters were so mild. I didn’t connect to any of the protagonists. It was not that they were unlikable, they were just… nothing special. They did not stand out. They just didn’t have much of a presence in the story, you know? Does that even make sense? I guess I am trying to say that they did not make an impression on me in the slightest; even as I was reading, I kept forgetting whose perspective I was reading from. They did not have clear, distinctive voices. I felt very distant from them. I did really appreciate that Ruby refrained from ‘dumbing them down’ - which happens more often in MG than you’d think. The effortless diversity was also nice (one of the MCs was Cuban). I was a little confused if Tess was meant to have anxiety or not, though. It is mentioned that she has ‘spells’ and her habit of catastrophizing situations is a major part of her characterisation. I guess I would have liked it to be a little clearer? I do need to say that I was completely rooting for Jamie’s grandmother. Go her for defying gender and age stereotypes and completely owning it! The Shadow Cipher was underwhelming. It had a fantastic premise but I felt that the world was not as developed as it could've been. The plot had its moment but ultimately failed to capture that urgency that a puzzle hunt needs to engage its reader. Maybe I have just read too many good ones now that I have raised the bar too high? Either way, I wish I had loved this one more than I did. I’ll definitely try the sequel because this had a cruel cliffhanger but I don’t have high hopes. I had never even heard of this book before, but I won the sequel through a giveaway and wanted to read this one first to better understand the one that I won. And I am glad that I did! Awesome book! I actually really enjoyed reading this! Even though it is a young adult book, which I typically stay away from, it was a nice and appreciated change of pace from my normal reading! The characters really came to life in this! I listened to the audiobook version because it was all I had access I had never even heard of this book before, but I won the sequel through a giveaway and wanted to read this one first to better understand the one that I won. And I am glad that I did! I'm not the sort of person who refers to books at "tales" or calls myself (or other authors) a "storyteller." I'm a writer. You're a writer. We're writers. Authors or writers. Except for Laura Ruby. Nope, she's a storyteller. This is a wonderful story, unlike anything you've seen before, and she's telling it to you. I feel the same way about her wonderful, award-winning BONE GAP. Years later I still remember that story. Not the words. The story. This is the same. I don't really remember the words I'm not the sort of person who refers to books at "tales" or calls myself (or other authors) a "storyteller." I'm a writer. You're a writer. We're writers. Authors or writers. Except for Laura Ruby. Nope, she's a storyteller. This is a wonderful story, unlike anything you've seen before, and she's telling it to you. I feel the same way about her wonderful, award-winning BONE GAP. Years later I still remember that story. Not the words. The story. This is the same. I don't really remember the words of this, but I can feel and imagine the story of this book. …so auch das Gebäude Nr. 354 West 73. Straße. Ist es ein Zufall, dass im alten Zuhause der Morningstars nun eine Familie wohnt, deren 12 jährige Zwillinge dieselben Vornamen haben wie Theodore und Theresa Morningstar? Und was hat es mit der mysteriösen Erbin der Morningstars – Miss Ava Oneal – auf sich, von der kein einziges Foto überliefert ist? Auch kann es kein Zufall sein, dass genau an dem Tag, als die Bewohner des Hauses 354 West 73. Straße den Räumungs-Beschluss zugestellt bekommen, ein Brief in die Hände von Tess und Theo gelangt, der darauf hin deutet, dass es hinter dem Code den die Menschen von York seit Jahrzehnten versuchen zu knacken einen weiteren Code gibt – einen Schattencode, der sie womöglich zu dem großen Schatz der Morningstars führt und die Rettung ihres Zuhauses bedeuten könnte. Theo – ist Pedant. Ein Mathegenie. Und er liebt Lego. Was er nicht liebt sind Veränderungen wie die, dass er womöglich bald seine Lego-Nachbildung des Towers wo anders aufbauen musss. „Viele Leute lesen nicht gern“, gab Jamie zu bedenken. „warum nicht?“, fragte Theo. Tess – ist das komplette Gegenteil ihres rationellen Zwillingsbruders – leidenschaftlich, impulsiv und mit einem leichten Hang zum Drama. Für sie bedeutet es den Weltuntergang schlechthin das fast schon lebendig anmutende Gebäude verlassen zu müssen und vielleicht sogar ganz aus der Stadt weg ziehen zu müssen. Zusammen bilden sie eine Einheit, die nur ganz schwer von Außenstehenden zu durchdringen ist. Sie ergänzen sich in ihren Eigenheiten. Sogar ihre eigene Geheimsprache haben sie entwickelt. Das ist auch der Grund, warum Jamie, der genauso alt ist wie Jess und Theo noch nie was mit ihnen am Hut hatte. Jamie – ist Künstler. Er hat ein einzigartiges Gedächtnis und versteht es mit wenigen Strichen eine Szene perfekt einzufangen. Am allerliebsten zeichnet er Superhelden. Er will seinen einen Superhelden erfinden – doch zunächst will er auch sein Zuhause – und damit die Arbeitssstelle seiner Grandma, die Hausmeisterin in 354 West 73. Straße ist -vor der Abrißbirne retten. Den Stil von Laura Ruby kann man nicht mit humorvoll beschreiben. Nein. Er ist genial witzig! Knappe Sätze und hohe Schlagzahl an intelligenten Gags machen richtig Laune beim lesen. Die Sprache ist bunt und malt wunderbare Bilder von einem futuristischen New York das ich so selbst gerne besuchen würde! Das Setting des fiktiven New York ist wunderbar bildlich gelungen. Mit einer Prise Steampunk, einem Archiv der Codisten das an Warehouse 13 erinnert und einer Handlung die Goonies Fans vor Freude tanzen lässt. Ich vergebe absolut verdiente 5 von 5 Lieblingslesesessel für Chroniken von York – Die Suche nach dem Schattencode! Der Verlag empfiehlt das Buch ab 12 – ich meine, dass es aber auch durchaus für jüngere Abenteurer hervorragend ist – besonders auch zum Vorlesen ruhig ab 8. Natürlich muss man dem komplexen Plot folgen, aber ich glaube das geht schon ganz gut in der dritten Klasse. Was es aber für Jugendliche und und Erwachsene nicht weniger spannend macht. Im Gegenteil! First half of this book was eh. Second half was a step up from eh. The Shadow Cipher is one of those books that has an awesome cover. That's it. The story was interesting but it ended up being a disappointment. I feel like the story building was good, information dumping was eh, and the characters were a bit forgettable. Honestly, I just kept zoning in and out of this book which broke my heart because I was so psyched for this book. The kids in this book are probably smarter than I am and they a First half of this book was eh. Second half was a step up from eh. The kids in this book are probably smarter than I am and they are 12. They were okay (in a sense) but nothing really struck out at me. Maybe it's because I was listening to the audio instead of reading the actual book.. but yeah, I just wasn't invested into them like I should be. I expected to be head over heels with this book and these characters but overall, it was just okay. Overall, I could see myself diving into the next book because this one is so fresh in my mind. However, I would probably try to get the physical or the ebook of it - just to see if there's a difference in my opinion on these characters. Middle grade, contemporary, but not our timeline, not steam-punk, but other science, verging on the magical. Characters were awesome and real, with foibles and strengths. Diverse. First "real" book I've read in a while. That may have colored my reading of it slightly in the positive. EBooks are great and all, but nothing beats turning real pages and needing an actual bookmark. Despite wanting to skip to the end to see what happened, I did not, as I wanted to travel Wow. Absolutely, awestruck WOW. Despite wanting to skip to the end to see what happened, I did not, as I wanted to travel the journey with the characters. Ending leads into a new adventure, but the main story arc is resolved, so while I am foaming at the mouth for the next book, I feel no need to get all Misery on the author. Wendy Thanks for your review - I concur! Cricket stands out as the most interesting character by far. Lizz Donnelly Yes! Team Cricket! Einfach rasant und abwechslungsreich, genau richtig. A thrilling start to an epic series! I can't wait to see the final edition with maps! Set in an alternate New York City, three kids race against the clock to solve a cipher designed by the city's greatest architects and inventors, the Morningstarrs. Though it's a hefty tome, this mystery is full of twists and turns as three kids discover a new clue that takes them down a path of alternate clues to solve the cipher. I am not normally a big mystery fan, but I loved the details in the setting - the interesting inventions from the Morningstarrs that resulted in an alternat This book!! Set in an alternate New York City, three kids race against the clock to solve a cipher designed by the city's greatest architects and inventors, the Morningstarrs. Though it's a hefty tome, this mystery is full of twists and turns as three kids discover a new clue that takes them down a path of alternate clues to solve the cipher. I am not normally a big mystery fan, but I loved the details in the setting - the interesting inventions from the Morningstarrs that resulted in an alternate New York City. This is a very rich story and one that I had a hard time putting down. There is a special type of agony in reading a book that you are increasingly enchanted with, with the knowledge that you're not going to get your hands on the sequel for another year, at least. 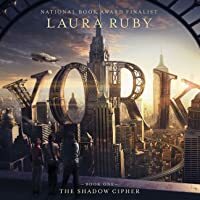 Such was the case with Laura Ruby's exceptional York: The Shadow Cipher. Ruby has created a fantastic steampunk version of New York, where inventions from the fabled Morningstarr twins, have dominated and ruled the city since 1792. But in 2017, the legacy of the twins - including a cipher, allegedly promis There is a special type of agony in reading a book that you are increasingly enchanted with, with the knowledge that you're not going to get your hands on the sequel for another year, at least. Such was the case with Laura Ruby's exceptional York: The Shadow Cipher. Ruby has created a fantastic steampunk version of New York, where inventions from the fabled Morningstarr twins, have dominated and ruled the city since 1792. But in 2017, the legacy of the twins - including a cipher, allegedly promising treasures beyond the finder's imagination - have faded from memory. It's not until a chance situation involving the young Biedermann twins and the loss of their home, sets them on a course to proving that the Old York Cipher is real. It's not that often that I say, "I want to live in this book and never leave," but that's pretty much how I feel about The Shadow Cipher. Ruby has created an extraordinary world, full of inventions and buildings that are designed to make the world operate more effectively, but also with a quirk and charm that reinforce just how wonderful the world can be. But even in the midst of these marvels, the world is still a capitalist one. Protagonists Tess, Theo and Jaime have to deal with the potential loss of their Morningstarr-created apartment, as a developer seems invested in tearing down their marvelous, historical building, in order to build new ones. Gentrification is a tough issue, and Ruby does a thorough job in explaining the developer's motivations and the larger impact on the city, without necessarily drawing the developer as a cartoon villain. But like any good adventure story, Ruby eventually guides her intrepid young characters into believing that there is a will and a way to save their beloved home. What follows is a madcap tale full of codes, extraordinary inventions, and even some subtle snark about male-only organizations, that will make any intrepid young reader feel grateful that they have fictional heroines who understand their quirks and thirst for knowledge, the way that Tess, Theo and Jaime do. This isn't just an adventure that we're reading; it's one we're living alongside them. Outside of the adventure aspects of the story, Ruby does a solid job in also acknowledging the many joys that come with knowledge and being well-informed. Theo and Tess especially are purveyors of knowledge, and it's that information that helps the trio move forward in their adventures. It's a nice nod to any reader that may have felt different in their lives, and will be highly appreciated. SAVE ME FROM SERIES WITH CLIFFHANGER ENDINGS, SOMEONE. I'm knocking off a star just for that. Otherwise, this is a good fit for anyone who likes The Westing Game (though this isn't quite as smart) or the Kate Milfords: it's a story about kids solving puzzles. There are good motivations in place and appropriately slimy villains; the kids actually run into obstacles, get scared, and find themselves constrained by their parents; a timeline is established and adhered to, so there are real consequenc SAVE ME FROM SERIES WITH CLIFFHANGER ENDINGS, SOMEONE. I'm knocking off a star just for that. Otherwise, this is a good fit for anyone who likes The Westing Game (though this isn't quite as smart) or the Kate Milfords: it's a story about kids solving puzzles. There are good motivations in place and appropriately slimy villains; the kids actually run into obstacles, get scared, and find themselves constrained by their parents; a timeline is established and adhered to, so there are real consequences. What I didn't like: this just-barely-alternate New York. For one thing, the "Underway." It's too familiar to the subway (same lines! which go to the same places! and yes, the cable car to Roosevelt Island takes Metrocards!) for its robots who keep cars spotless, and people who are unceremoniously removed for violence or littering, to read as an alternate universe. Instead it just reads as wish fulfillment, and so the science fiction turns feel like they come out of left field. So much fun! I just love Laura Ruby's writing. In this book she makes a lot of changes to New York, but it retains the essence of the city. An awesome middle grade that's definitely worth your while! I wish this book would have been around when I was middlegrade age. This is exactly the kind of book I would have loved at that time. 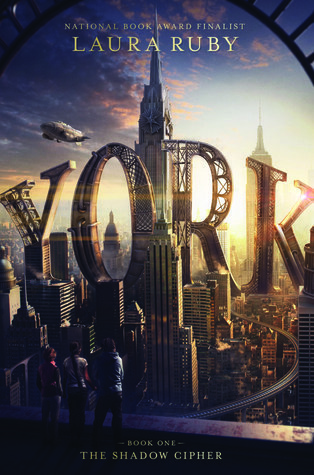 This series is a steampunky fantasy story about three kids who embark on a journey through an alternate version of New York, to decipher a century-old puzzle, left by the architects of the city. Not only does this sound like a very interesting premise, the execution, in my opinion, is pretty great. The characters are exactly the kind that I would have loved at that age: they are smart, curious and a little nerdy. The writing is full of sass, funny and engaging, and even thought this book is almost 500 pages long, you will fly through it. The main appeal of this book to me was how smart it was. This is reflected in the characters who make being scientificly interested and intelligent look cool. They are the kind of kids nerdy-eleven-year-old me would have love to relate to. Laura Ruby also does not underestimate the intelligence of her reading. Middlegrade can sometimes seem a little oversimplified, as authors are afraid to go over their readers head. Laura Ruby does not shy away from complexity, which I think many smart middlegraders will absolutely appreciate. I loved how they each had a role to play, Jamie drew out when they found a new thing. While Theo was the textbook giving the history. And Tess she is also very smart, but also can lie the best out of the three of them. Also the friendship is sweet for they all are fighting for a common cause and that's so no one would leave the only home they know. Plus the twins have a giant cat who is everything. She goes along with most of there adventure. She keeps Tess calm and scare off baddies what's not to love. The premise of this middle-grade novel sounded really interesting - if also rather similar to Ready Player One - but opens up into more of a conspiracy magiteck story than a straightforward competition to solve a puzzle for cash. I found the beginning _really_ hard to get into, in part from a feeling of having quirkiness thrown at me from every direction, but eventually it settled down into a readable adventure tale. There's a lot of fantastical worldbuilding in this book, and a lot of rather unbelievable non-fantasy events that kept jerking me out of the story (I refuse to believe anyone, no matter how rich and corrupt, could have wangled the destruction of the building without massive protests etc). And, though I knew this was the beginning of a series, I felt rather unsatisfied by the resolution. It also assumes a lot of knowledge of US historical figures that might pass non-USians by. Oh My Gosh..... If you are looking for an amazing Middle Grade book check this one OUT!!!!! This book started out very strong but sort of fizzled out at the midway mark. I wish the author had focused more on the back story,especially Ava's character and her history. I may read the second book in the series but I will borrow it from the library instead of purchasing it. I had high hopes for this book, but they were not met. I have read much better mystery books and much better middle grade books. Recommends it for: Me? Recommend this book? HECK NO. Okay, I DNFed this for two reasons. 1. The loan ended in the electronic library and I couldn't renew it. Just from #1, I know what you're thinking. You're probably like, "Yasmeena, why couldn't you have put it on hold and continued it later? Or just returned it and borrowed it again?" 2. What's the point? It just isn't good. I DNFed at 54%, as you can tell from when I started this review. 54%. And you know what happened? NOTHING! Nothing was happening, and I was already more than halfway there. The main reason why I picked this up is because at first, when I saw "Cipher" in the title, that got me into it. Already. I read the sypnosis, and I love books with puzzles that the main character has to solve (I'm looking at you Blackthorn Key). From what I read, there was just traveling, clues, talk. Traveling, clues, talk. TRAVELING, CLUES, TALK. I didn't get what was going on. Do I recommend this? No. Oh man... this has been a book I’ve been saving as a reward for finishing other books. I really wanted this to be SO cool! The description and word “cipher” led me to believe lots of puzzles for the reader to participate in would be part of the joy of this book, but that just didn’t play out like I had hoped. I actually thought the setting was very unique but I often found myself confused. The overall idea and writing style was memorable, but I was disappointed by the details along the way. I will Oh man... this has been a book I’ve been saving as a reward for finishing other books. I really wanted this to be SO cool! The description and word “cipher” led me to believe lots of puzzles for the reader to participate in would be part of the joy of this book, but that just didn’t play out like I had hoped. I will admit that for such a thick book, this read very fast. “The therapist her parents brought her to see liked Tess to do a lot of drawings. . . . He said, "It's interesting that you drew yourself with this little golden crown on your head. What does the crown mean to you?"